WASHINGTON – Months after the horror of the Parkland school shootings in Florida, President Donald Trump stood before cheering members of the National Rifle Association on Friday and implored them to elect more Republicans to Congress to defend gun rights. During a televised gun meeting with lawmakers in late February, he wagged his finger at a Republican senator and scolded him for being “afraid of the NRA,” declaring that he would stand up to the group and finally get results in quelling gun violence. But he later backpedaled on that tough talk. Trump briefly referenced the Parkland shootings in his speech, saying that he “mourned for the victims and their families” and noting that he signed a spending bill that included provisions to strengthen the federal background check system for gun purchases as well as add money to improve school safety. 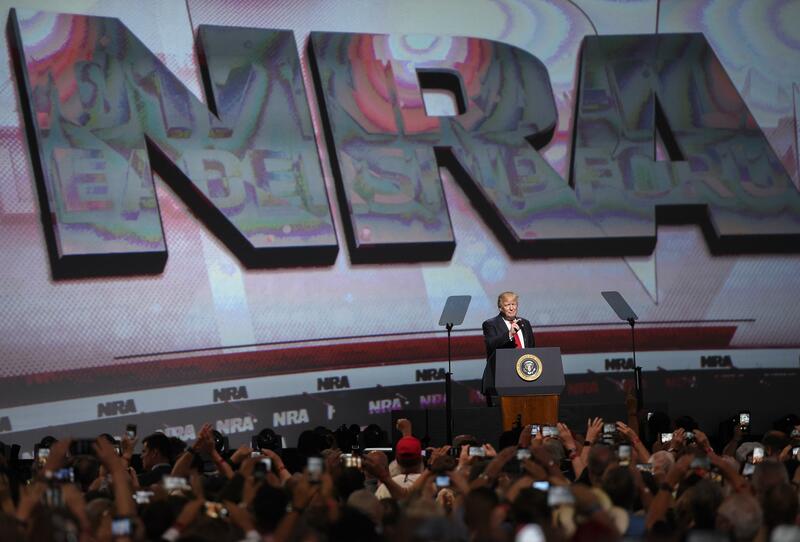 Trump’s speech in Dallas was his fourth consecutive appearance at the NRA’s annual convention. His gun comments were woven into a campaign-style speech that touched on the Russia probe, the 2016 campaign, his efforts in North Korea and Iran and his fight against illegal immigration. While the president veered wildly off topic at times – speaking about entertainer Kanye West’s recent support and former Secretary of State John Kerry’s bicycle accident three years ago – he repeatedly returned to the message of the day: his support for the Second Amendment. Trump has long enjoyed strong backing from the NRA, which spent about $30 million in support of his presidential campaign. He was introduced by Vice President Mike Pence, who pointed to his own support for gun rights and accused the news media of failing to tell “the whole story” that “firearms in the hands of law-abiding citizens” make communities safer. Back in February, Trump had praised members of the gun lobby as “great patriots” but declared “that doesn’t mean we have to agree on everything. It doesn’t make sense that I have to wait until I’m 21 to get a handgun, but I can get this weapon at 18.” He was referring to the AR-15 the Parkland shooting suspect is accused of using. But after expressing interest in increasing the minimum age to purchase an assault weapon to 21, Trump later declared there was “not much political support” for that. He then pushed off the issue of age restrictions by assigning it to a commission. Published: May 4, 2018, 7:46 a.m. Updated: May 4, 2018, 2:34 p.m.